17.4" x 8.6" stitched on 14 count. 13.6" x 6.7" stitched on 18 count. 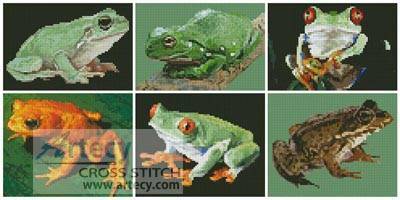 Frog Sampler cross stitch pattern... This counted cross stitch sampler pattern of 6 different frog patterns was designed from photographs copyright of www.photos.com You can stitch the whole design or there are six individual patterns. Only full cross stitches are used in this pattern.